Clay was her primary medium of artistic expression until she found herself with many pounds of wool from her father-in-law’s sheep. 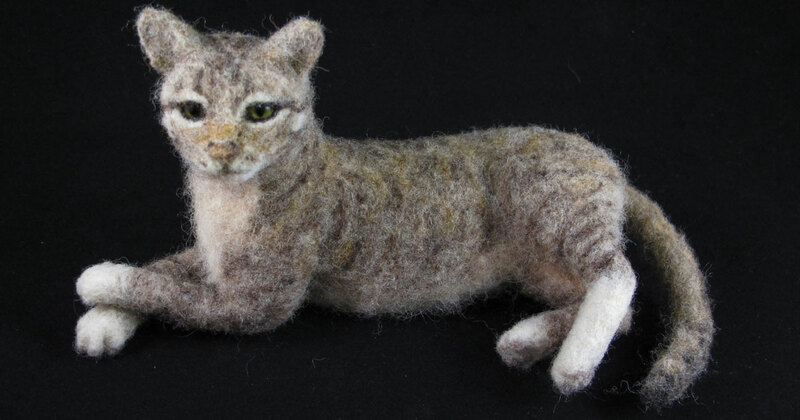 In an effort to make use of the wool that came in year after year, she discovered needle felting, a technique in which the wool is shaped by thousands of insertions, by hand, with a special needle. The wool begins to matt together in a shape and form that can be controlled. This was the type of sculpting of animals Laura had been craving in her art. “This medium and technique afforded me the kind of control I’d longed for when sculpting,” she commented. Laura begins each piece by sculpting a thin wire armature around which she wraps her wool roving. Next, a shape unique to the specific species or breed is sculpted by adding the wool bit by bit and felting it down. Lastly, the color and textural coat treatments that represent the distinctive characteristics of the subject’s form and disposition are applied. Using photographs as a guide, her miniature creations are quite lifelike. She receives many commissions for pet portraits. “I love hearing stories about love and loss from pet owners near and far,” noted Laura. “Working with them over the time it takes to create a pet sculpture can be very intimate.” Laura tries to capture not only the physical likeness but also something of the pet’s personality and character. Most are miniatures that range in size from 3.5” tall to 5” tall and take upwards of 40 hours to complete. Larger pieces have taken 80 to 150+ hours. She has moved on to create more advanced and larger animals, such as elephants and horses. “I feel supported by the art community and individual artists and collectors here in Winston-Salem,” said Laura. “The Sawtooth School nourished my clay inquiries. Urban Artware and the SEED Gallery both propelled my work forward. Kim Varnadoe at Salem College helped find opportunities to exhibit with local and national artists. Piedmont Craftsman Inc. juried in my work and Krankies Craft Fair is such a hub of creativity and lovely artists.” Laura is a juried member of The Piedmont Craftsmen Guild and a member of the Mountain Homespun Fiber Guild of NWNC and SWVA. 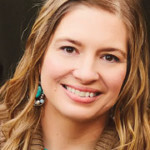 Laura demonstrates her work and sells fiber sculptures, wool, wool bracelets, wool for ballet pointe shoes and more at Cobblestone Farmers Market on Saturdays from 9 am – noon. Her work will be on display at d’Art Gallery in Norfolk, VA, May 3 – June 9, 2018. She also teaches one-on-one classes on felting and gives presentations on the art form. For more information, visit farmgirlarts.com. Camel City Creates is a monthly column of Forsyth Womanmagazine featuring talented creative women in our community.